[151 Pages Report] The photonics market is projected to grow from USD 489.94 Billion in 2016 to USD 795.54 Billion by 2022, at a CAGR of 8.4% during the forecast period. The base year considered for this study on the photonics market is 2016, while the forecast period is between 2017 and 2022. Both, top-down and bottom-up approaches have been used to estimate and validate the size of the photonics market, and to determine the sizes of various other dependent submarkets. The research study that has been employed involved the extensive use of secondary sources, directories, and databases, such as Hoovers, Bloomberg, Chemical Weekly, Factiva, and other government and private websites to identify and collect information useful for the technical, market-oriented, and commercial study of the photonics market. Philips (Netherlands), Schott (Germany), Nikon Corporation (Japan), Shin-Etsu Chemical Company (Japan), Hoya Corporation (Japan), Corning (US), Asahi Glass Company (Japan), II-VI Inc. (US), Ohara Inc. (Japan), and American Elements (US) are the key players operating in the photonics market. 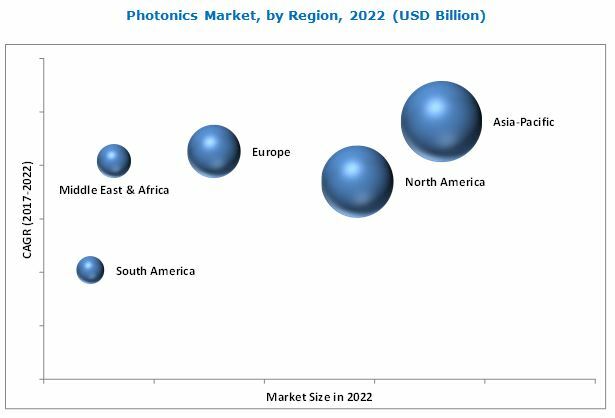 This research report categorizes the photonics market on the basis of product type, application, end-user industry, and region. Photonics is defined as the science and technology of generating, controlling, and detecting photons, which are particles of light. The applications of photonics include displays, information & communication technology, photovoltaic, medical technology & life sciences, measurement & automated vision, lighting, and production technology, among others. The photonics market is projected to grow from USD 530.52 Billion in 2017 to USD 795.54 Billion by 2022, at a CAGR of 8.4% from 2017 to 2022. On the basis of end-use industry, the media, broadcasting & telecommunication segment accounted for the largest share of the photonics market in 2016, and this trend is expected to continue during the forecast period. Photonics is used in this segment for communication, data storage, and data sharing purposes. The use of photonics products has significantly increased the speed of internet and the quality of voice calling. Asia Pacific accounted for the largest share of the photonics market in 2016, and the market in this region is also projected to grow at the highest CAGR during the forecast period. China is expected to account for the largest share of the Asia Pacific photonics market by 2022, with India registering the fastest growth rate during the forecast period. Japan is home to prominent photonics companies, such as Nikon Corporation, Shin-Etsu Chemical Company Limited, and Hoya Corporation. The US accounts for the highest demand of photonics in North America. All these factors have contributed to the high demand for photonics products around the globe. Philips (Netherlands), Schott (Germany), Nikon Corporation (Japan), Shin-Etsu Chemical Company (Japan), Hoya Corporation (Japan), Corning (US), Asahi Glass Company (Japan), II-VI Inc. (US), Ohara Inc. (Japan), and American Elements (US) are the key companies manufacturing photonics products. 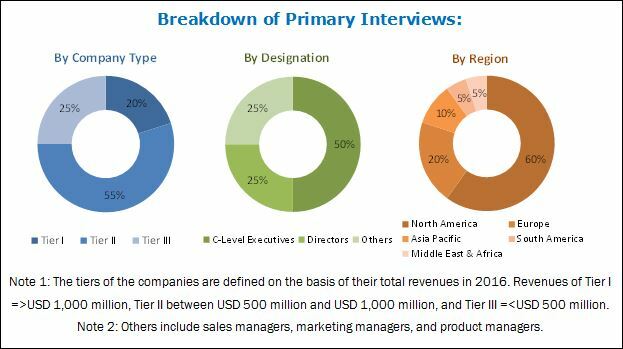 These market players, with a strong foothold in the global market, have adopted growth strategies such as new product launches, expansions, and mergers & acquisitions to enhance their market shares and expand their distribution networks across the globe. These companies are also engaged in R&D activities to innovate and develop products that can open avenues for new applications. In February 2017, Philips launched its new GreenPower LED interlighting system. This system boosts yield, with sideways-facing LEDs focusing growth-stimulating light on the most vital parts of crops. Earlier, in March 2016, Philips launched its new range of products, which include DigiStreet, Philips Hue white ambiance, and Philips classic LED lighting systems, for offices, shops, streets, and homes.